1992-1999 - Attendance at the Great Western Forum. 2013-2014 - Attendance includes one game at Dodger Stadium. We'd like to introduce you to the STAPLES Center, the foremost entertainment complex in the country, located right here in Los Angeles, the entertainment capital of the world. Far more than just a building to house sporting events, we're planning a monumental and unparalleled destination that will offer year-round entertainment, and extensive retail environment, dining options and public spaces. In features and amenities, the area will be second to none. This new "city within a city" will sit at the hub of freeways and transit systems, making its central downtown location easily accessible to all of Los Angeles. Additionally, STAPLES Center will serve as a valuable resource for the entire community, aiding educational programs and improving the quality of life for the youth of Los Angeles, giving us all something to cheer about. Ours will be the first major arena of the new millennium. As befits a trendsetter, it will incorporate the best features of the newest generation of arenas, and have numerous outstanding innovations of its own. Privately financed and costing an estimated $300 million, the arena will have the clearest sight lines, the best amenities, restaurants, sports bars, and more. Because it will be the focal point for Los Angeles in the 21st century, it will be extraordinary, a destination second to none. * Two public concourses with video walls and monitors so you don't miss any of the action. * Twenty-four concession stands and food courts that will feature traditional arena fare, as well as "Taste of L.A." specialties. * A Kings and Lakers team store, featuring the latest in NHL and NBA fashions. * Restrooms around every corner (twice the capacity of current L.A. facilities). * A 500-seat "members only" arena club for pre- and post-game dining. * A sports bar and restaurant for pre- and post-game gathering. * Consumer Centers on both public concourses, featuring ATMs, phones, and cellular access. * 160 of the most luxurious, state-of-the-art and exclusive suites ever built -- the perfect place to entertain clients, family and friends. Reserve your place. Don't wait until the arena is built to secure the best seats at STAPLES Center, because they'll be gone. Priority seating at the new arena will be offered first to the Kings season ticket holders and Senate Seat holders. To order season tickets and reserve your seat at STAPLES Center, call the Kings Sales Department at 1-888-KINGS-LA. March 8, 1999 (AP) - A fire devoured stacks of roofing insulation atop the unfinished Staples Center in Los Angeles, but damage was considered minor and there should be no delays in the scheduled October opening of the new home for basketball's Lakers and Clippers and hockey's Kings. The blaze was attributed to an electrical problem. October 13, 1999 (AP) - In a $375 million palace fit for a King - or a Clipper - the seats are wide-bodied and the shower heads are 9 feet high. For some, there are fireplaces, wine cellars and humidors. The nation's newest mega-sports arena, the privately financed Staples Center, opens this month. Los Angeles boosters hope its packed calendar of basketball, hockey, concerts - even the Democratic National Convention - helps rejuvenate downtown. "We have a 9-to-5 downtown right now," said Carol Schatz, president of the Central City Association of L.A. "What Staples does when it opens its doors is make downtown a 9-to-11 area. We'll take that." The architects wanted the sports and entertainment complex to reflect its city's passion for seeing and being seen, so they put tons of glass under neon lights. Staples, the office supply company, paid $100 million for the right to put its name on the place. The center will be home to basketball's Lakers and Clippers, hockey's Kings and the Avengers, a new indoor football team that begins play in April. On Sunday, Bruce Springsteen and the E Street Band open a four-night stand at the Staples Center. The center also will play host to the Grammy Awards in February and the Democratic convention in August. The Kings and Lakers are moving across town from the Great Western Forum, which opened in 1967; the Clippers are leaving the old Sports Arena in Exposition Park, next to Memorial Coliseum. None of those places has the style or amenities of the Staples Center, a 1 million-square-foot wonder with palm trees, terrazzo floors, a constant light show and airy lobbies that reveal the surrounding skyline. The basketball locker rooms have shower heads 9 feet above the floor so 7-footers like Shaquille O'Neal of the Lakers and Michael Olowokandi of the Clippers won't have to stoop to get wet. There are 20,000 seats for basketball; 18,500 for hockey and arena football. And there is plenty of luxury - 160 three-story suites that cost between $197,000 and $307,500 a year. In addition, there is the Grand Reserve Club for 200 members that costs $10,500 a year and features an indoor-outdoor fireplace, a wine cellar and a humidor with 36 drawers for cigars. The $375 million Staples Center in Los Angeles was constructed in a record 18 months. Fan intimacy and a sweeping theatre-sized screen are two of the main features of the design for the Arena. Back in December 1997 the City of Los Angeles' Cultural Affairs Commission approved the design for the new, state-of-the-art sports and entertainment facility that became the home of the Los Angeles Kings and the Los Angeles Lakers in October 1999. The STAPLES Center is located on the south-west corner of 11th and Figueroa Streets in downtown Los Angeles. It is immediately adjacent to the Los Angeles Convention Center and is accessible to the 110 (Harbor) and 10 (Santa Monica) freeways. The STAPLES Center is a 900,000 square feet sports and entertainment facility, which seats 20,000 basketball fans and 18,500 for hockey. The intention of the design was to enable it to host more than 230 sports, entertainment and family-oriented events annually. It consists of 160 suites, 32 party suites and 2,500 club seats over five concourses and 22 concession stands. The Center's design also had to be compatible and street friendly with Figueroa Street. According to architects NBBJ, "The building's design is all about energy and movement." As well as the sport and entertainment facilities it has retail and team office space. It will be the first arena in the world designed to accommodate three professional teams, the NBA Lakers and Clippers and the NHL Kings. To add to the diverse program, special floor area configurations allow an unprecedented turnover rate of entertainment events. To further reduce the height, it was decided to recess the bowl approximately 8m below the adjacent street level. This allows fans to enter the arena at a prominent concourse level. The trucks and maintenance vehicles would be required then to ramp down to the lower level docks to load and unload. There are three major design elements: the large public entrance lobbies, the three levels of private suites and the sloping roof that sweeps from the convention centre tower toward the central downtown core. PCL Construction, along with NBBJ Sports and the Arena Development Corp, managed the 150 strong team that built the Staples Center Arena. The Staples Center was on an 18-month schedule; the contract included a $50,000 fine for every day the project went past deadline. The new state-of-the-art sports and entertainment facility was issued with a Temporary Certificate of Occupancy on 1 October 1999 by the City of Los Angeles, two weeks earlier than scheduled. 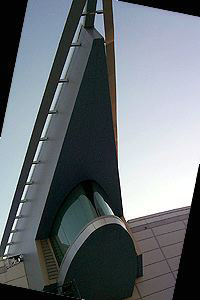 An arching supertruss is the building's main structural support and is purposely reflected in the exterior design of the roof. 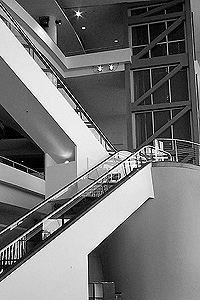 All five of its concourses are open, as terraces, to the full 85ft height of the public lobbies. 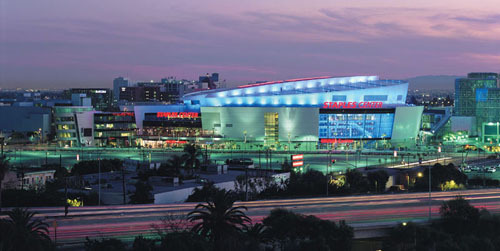 Sullivan Concrete Textures (SCT) of Costa Mesa CA supplied decorative concrete to the Staples Center. SCT poured over 2,500 yards of concrete and was responsible for all walkways, courtyard areas and the exterior concrete on the perimeter. The architect's concept of the Center was that it should glow and pulse with light and sound at night. Materials used in the building reflect that idea, with the concrete walkways having silica carbide added to the concrete surface to give it sparkle. Two different coloured concretes were used. The Center's main entrance area was poured with alternating light and dark grey colours in various sized shapes. In certain areas, local artists incorporated sphere and swoosh tail-like designs that were saw cut into the concrete and then filled with coloured grout. Anning-Johnson's Los Angeles office installed 260,000 square feet of Sarnafil Single Ply roofing on this arena, including the red membrane at the "Staples" logo. Web-enabled project management software was supplied by e-Builder, a Florida-based company. The advantages of using the e-Builder Web portal have proven to be critical to the arena completion. Prior to using a portal, the average turnaround time for an RFI (request for information) at the Staples Center Arena was approximately 28 days. After implementation of e-Builder, RFI turnaround time was reduced to an average of a mere nine days. The new portal was implemented within 24 hours. PCL Construction implemented J.D. Edwards Supply Chain software to Manage Change and Assets. PCL used project cost tracking to monitor costs and better forecast the impact of changes to the original budget. The L.A. Arena Company is co-owned by Philip Anschutz, CEO of The Anschutz Company, and Edward P. Roski Jr., President, Majestic Realty Co. The pair are also co-owners of the Los Angeles Kings Hockey Club. The Anschutz Entertainment Group and FOX Entertainment Group are the majority owners and operators of the STAPLES Center and the STAPLES Center expansion. The owners required at least 150 suites in prime locations to satisfy their revenue requirements. Most of the suites are at one end over three levels leaving the "stage end" for concerts. 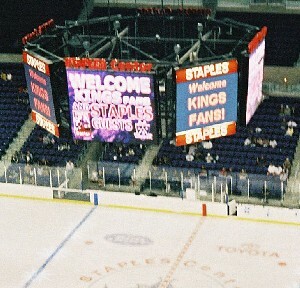 Staples Centre has been designed with a sweeping theatre-sized screen location at the highest end of the upper seating bowl. The design is reflected in the sloping roofline that gives the facility its most distinctive feature. In September 2001, the Los Angeles City Council approved the LA Arena Land Company's development plan for the LA Sports & Entertainment District (LASED) adjacent to STAPLES Center. The proposed development, which encompasses approximately four million square feet adjacent to the arena, is expected to incorporate two hotels, including a 1,200 room Convention Center headquarters hotel, shops, restaurants, live theatre, housing, an open air plaza and an expansion of the Convention Center. 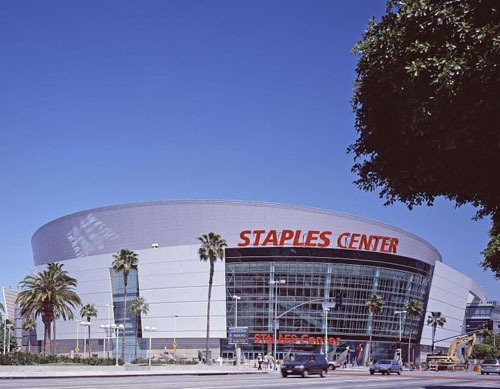 The Bank of America underwrote the project with a $305 million credit facility to finance construction of STAPLES Center. The agreement is thought to have been the largest private financing of a sports arena anywhere in the United States. The Fox Group entered into a partnership with the L.A. Arena Company that granted Fox a minority interest in the Staples Center development. $2 million was spent on lighting; along with a $1.5 million Bose sound system, packaged into five concourses with 23 refreshment stands and dining choices. 1,200 televisions screens are positioned in clusters throughout the building. The venue set a new record for naming rights in a $100 million deal with office-supplier Boston-based Staples, Inc. and it is the only venue to host two NBA teams and one NHL team.